Our Abpromise guarantee covers the use of ab176943 in the following tested applications. Histone demethylase that specifically demethylates 'Lys-9' and 'Lys-36' residues of histone H3, thereby playing a central role in histone code. Does not demethylate histone H3 'Lys-4', H3 'Lys-27' nor H4 'Lys-20'. Demethylates trimethylated H3 'Lys-9' and H3 'Lys-36' residue, while it has no activity on mono- and dimethylated residues. Demethylation of Lys residue generates formaldehyde and succinate. Participates in transcriptional repression of ASCL2 and E2F-responsive promoters via the recruitment of histone deacetylases and NCOR1, respectively. Isoform 2: Crucial for muscle differentiation, promotes transcriptional activation of the Myog gene by directing the removal of repressive chromatin marks at its promoter. Lacks the N-terminal demethylase domain. The 2 Tudor domains recognize and bind methylated histone H3 'Lys-4' residue (H3K4me). Double Tudor domain has an interdigitated structure and the unusual fold is required for its ability to bind methylated histone tails. Trimethylated H3 'Lys-4' (H3K4me3) is bound in a cage of 3 aromatic residues, 2 of which are from the Tudor domain 2, while the binding specificity is determined by side-chain interactions involving residues from the Tudor domain 1. The Tudor domains are also able to bind trimethylated histone H3 'Lys-9' (H3K9me3), di- and trimethylated H4 'Lys-20' (H4K20me2 and H4K20me3). Has high affinity for H4K20me2, blocking recruitment of proteins such as TP53BP1. Ubiquitinated by RNF8 and RNF168 following DNA damage, leading to its degradation. 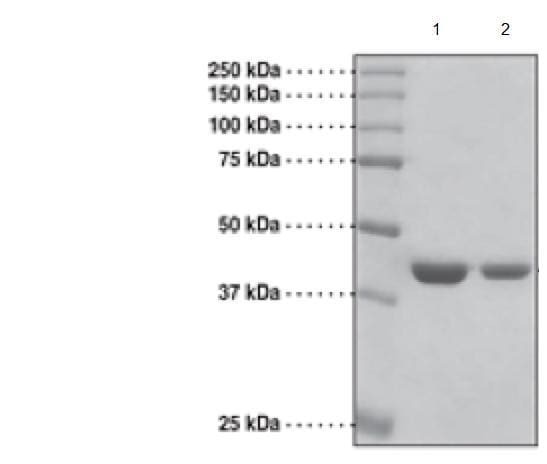 Degradation promotes accessibility of H4K20me2 mark for DNA repair protein TP53BP1, which is then recruited. ab176943 has not yet been referenced specifically in any publications. Publishing research using ab176943? Please let us know so that we can cite the reference in this datasheet. There are currently no Customer reviews or Questions for ab176943.